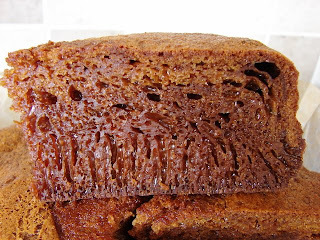 This is a Malay caramel cake very popular in Indonesia, Malaysia and Brunei. Commonly called honeycomb cake. In Malay it is called Kuih Sarang Semut translated as ant's nest cake. The cake is full of tunnels or holes and is quite chewy. This cake is quite simple to make once you got the syrup sorted. The ingredients and baking method are quite different to a typical western cake. Burnt sugar syrup and condensed milk are the typical ingredients. Tin size: 9" or 23- 24 cm round tin. If you use a spring form or loose bottom tin, line the whole tin with paper, see slide show. Don't just line the bottom the mixture will leak. If you use a cake tin without a loose bottom you can line just the bottom with paper. In a small saucepan, add in sugar and heat at medium heat till the sugar begin to melt. Stir once or twice with one single chopstick (don't use wooden spoon, too much area for the sugar to cool and crystallise), once the melted sugar has turned golden yellow, turn the heat to right low and continue heating till the sugar turns golden brown like dark tea, see slide show. Heat off and let it cool for 30 seconds. Then add one tbsp of water at a time, stand back the hot sugar will spit. Continue adding water one tbsp at a time till it stops sizzle, then pour in the rest of water. Turn heat on for about 1 minute, stir and scrape the side to release any unmelted sugar. Heat off and add the butter stir till melted. In a large mixing bowl add in the plain flour, pour in about 1/2 the liquid and mix with a electric beater till smooth, continue adding the liquid till all mix in. Let the mixture stand for about 10 - 15 minutes. Turn the oven to 150 deg C and bake the cake from cold for 1 hour or till it is cooked by sticking a cocktail stick in the centre and it comes out clean. I am so glad you have posted this, other instructions I have come across have been a bit hazy. I have been very intrigued by this. I notice in a lot of recipes 'Ovalette' is called for, I assume its like flour improver - any idea if that is the case? There are lots of recipes for this cake on the website, not found any I think is good enough to show the characteristic of this cake. Most of the ones I've seen used far too much bicarb which give a nasty aftertaste. Ovalette is a cake emulsifier, a very sticky orangy paste, only available in the far east like S'pore, Malaysian or Brunei. Ovalette should never be used for this honeycomb cake. Re the Ovalette, I should have said that I had seen it in recipes for Lapis. I assume that the original recipe stems from Tree cakes so perhaps its not really necessary. As its such a lengthy process and involves about 2 doz eggs I would like some reassurance that it would be worth it. Perhaps when I have a spare day I shall have a crack at it. Hope you like the honeycomb cake. Ovalette should only be used for super soft sponges only. Ovalette will bind cake mixture and whip up like mousse. There is no benefit to use it for honeycomb or kuih lapis. I may be making kuih lapis this week or next. My recipe use 15 egg yolks. Do you have a recipe for Ma-Lai Goh? The chinese steamed spomge you can get when Yum-Cha? My mum likes it and where I used to work, there was a lovely chinese lady (customer) who would bring one in for me. She said it was simple but I never managaed to master the recipe! You mean the light brown HK yum cha style? I will make one and post later. Leave the syrup mixture with the butter and sugar to cool (lukewarm is fine) before stirring in the flour. I've deleted your comment by mistake. Here is your question and answer on the comment before this. Does the syrup need to be cool down or I have to use the hot syrup? Thanks. can i subtitute condensed milk with evaporated milk ? if so, weight for weight? would it change the taste a lot?? I have not done that before if you like to try you'll have to experiment.